When someone is diagnosed with thyroid cancer, an entire family and community is affected. Create a treasured network of support for these courageous people by showing your commitment in finding a cure. 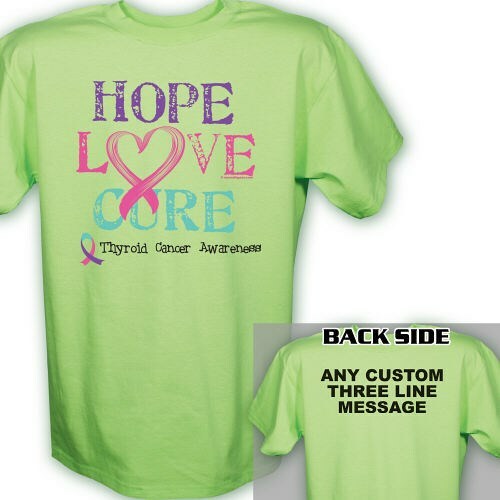 Wear our Hope Love Cure Thyroid Cancer Awareness T-Shirt at your next awareness walk event to proudly show you are walking with love and compassion. Our Personalized Thyroid Cancer Shirt for Awareness is available on our premium 100% cotton T-Shirt, machine washable in youth sizes XS-L and adult sizes S-3XL. Includes FREE Personalization! Personalized your Awareness Shirt for Thyroid Cancer with any three line custom message on the back. The shirts are a nice heavy weight- not cheaply made. I was a little disappointed in the size of the personalization on the back of the shirt. It was a little small. My suggestion would be to add a few fonts and font sizes for customers to choose from. Take a look at our ever growing collection of Personalized hyroid Cancer Awareness Shirts and Walk Gear to show your support today. Walk in style with this Thyroid Cancer Awareness Shirt or our Throid Cancer Awareness Sweatshirt at your next awareness walk. Be sure to also take a look at our Thyroid Cancer Awareness Key Chain to show your support every day.